Hi everyone! I'm late posting this week's Color Challenge here on my blog but here it is. I was inspired by my friend Vera's card. 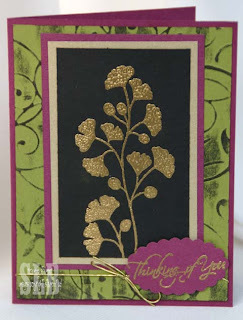 As soon as I came across it in the Stampin' Addict's gallery, I knew it would make a great color combo challenge. So, this morning I got up and walked into the studio bound and determined to make a card with this week's colors: Rich Razzleberry, Basic Black, Brushed Gold and Old Olive. I'm busily doing laundry and packing as I leave for Salt Lake City and convention in the morning! I'm so looking forward to connecting with my long distance friends and of course all the great demonstrations and classes. I hope you'll check out my blog this week as I share many of my convention swaps and display samples. Have a great week everyone!! Uh HUH! Luv this one!!! I'm sorta puzzled about the b/g so is it: Texturz plate then sponged or?? ?